Shrub or small tree to 6 m tall Leaves: alternate, pinnately compound, hairy-stalked, 15 - 30 cm long, winged between the five to 23 leaflets. Flowers: either male or female, found on separate plants (dioecious), greenish yellow, borne on a dense branched inflorescence (panicle) 10 - 20 cm long and 7.5 - 10 cm wide. Fruit: fleshy with a center stone (drupe), red, 4 - 5 mm long, slightly flattened, sparsely hairy. Twigs: hairy when young, with U-shaped leafscars. Buds: reddish brown and hairy. Leaflets: shiny dark green above, 3 - 9 cm long, 1 - 4 cm wide, oblong to lance-shaped or narrow egg-shaped with a pointed tip and unequally-sided (oblique) base, non-toothed or with few teeth near the tip, usually hairy beneath. Fall color is excellent red. Form: dense and compact when young, becoming more open and irregular with age, having crooked and spreading branches. 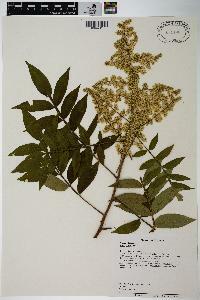 Similar species: Rhus copallina is represented by two varieties in the Chicago Region. See links below for further information. The other Rhus species with pinnately compound leaves and Toxicodendron vernix lack a winged stalk between the leaflets. Habitat and ecology: Occasional to rare in open, sandy black oak savannas, woods, or sandy fields. Notes: This sumac's beautiful, shiny leaves and fall color make it desirable for ornamental planting. It is often planted on dry, rocky soils, along banks, and used for naturalizing. Etymology: Rhus is the Greek name for a species of sumac. Copallina means resinous. Shrub or small tree to 6 m tall Leaves: alternate, pinnately compound, hairy-stalked, 15 - 30 cm long, winged between the seven to 23 leaflets. Flowers: either male or female, found on separate plants (dioecious), greenish yellow, borne on a dense branched inflorescence (panicle) 10 - 20 cm long and 7.5 - 10 cm wide. Fruit: fleshy with a center stone (drupe), red, 4 - 5 mm long, slightly flattened, sparsely hairy. Twigs: hairy when young, with U-shaped leafscars. Buds: reddish brown and hairy. Leaflets: shiny dark green above, 3 - 9 cm long, 1 - 2 cm wide, oblong to lance-shaped with a pointed tip and unequally-sided (oblique) base, non-toothed or with few teeth near the tip, usually hairy beneath. Fall color is excellent red. Form: dense and compact when young, becoming more open and irregular with age, having crooked and spreading branches. Similar species: Rhus copallina var. latifolia differs from Rhus copallina var. copallina because it usually only has five to thirteen leaflets that are wider (1.4 - 4 cm) and broadly oblong to narrow egg-shaped. Habitat and ecology: Sandy fields or open, sandy black oak savannas. Shrub or small tree to 6 m tall Leaves: alternate, pinnately compound, hairy-stalked, 15 - 30 cm long, winged between the five to thirteen leaflets. Flowers: either male or female, found on separate plants (dioecious), greenish yellow, borne on a dense branched inflorescence (panicle) 10 - 20 cm long and 7.5 - 10 cm wide. Fruit: fleshy with a center stone (drupe), red, 4 - 5 mm long, slightly flattened, sparsely hairy. Twigs: hairy when young, with U-shaped leafscars. Buds: reddish brown and hairy. Leaflets: shiny dark green above, 3 - 9 cm long, 1.5 - 4 cm wide, broadly oblong to narrow egg-shaped with a pointed tip and unequally-sided (oblique) base, non-toothed or with few teeth near the tip, usually hairy beneath. Fall color is excellent red. Form: dense and compact when young, becoming more open and irregualr with age, having crooked and spreading branches. Similar species: Rhus copallina var. copallina varies from Rhus copallina var. latifolia because if has up to 23 leaflets that are narrow (1 - 2 cm wide) and oblong to lance-shaped. Etymology: Rhus is the Greek name for a species of sumac. Copallina means resinous. Latifolia means broad-leaved. Rather frequent in some of the northwestern and southern counties, being rare or local in the remaining counties, or absent in some of the east-central counties. It prefers a rather dry sandy soil and is found mostly in the open along roadsides, fences, and railroads and in abandoned fields and open woodland. Fernald & Griscom (Rhodora 37: 167-168. 1935) write that the typical form of this species has "lance-oblong leaflets definitely attenuate at the base" and more leaflets than our interior plant. They give the range of the typical form as along the coast from New York to Florida. They add that our form "has the comparatively few leaflets more ovate-lanceolate or short-oblong and rounded at the base," and should be known as var. latifolia Engler (DC. Mon. 4: 384. 1883) with a range from Maine to Michigan, southward into the upland of North Carolina and Oklahoma. Most of my specimens belong to this wide-leaved variety, and I have the typical form from Starke and from the Ohio River Counties. However, since we have forms intermediate between these two extremes, it seems best not to separate them in our area. Shrub or small tree to 6 m; young twigs, petioles, and lf-rachis closely hairy; lfls 7-21, shining above, firm, oblong to lanceolate, 3-8 cm, inequilateral, entire or with a few teeth along the distal margin; lf-rachis winged, the wings 1-5 mm wide, interrupted at the base of each pair of lfls; infl to 15 cm; fr 4-5 mm, somewhat flattened, red, pilose with simple hairs and also beset with minute ovoid hairs. Open, dry places; s. Me. to Fla., w. to Ind., s. Ill., se. Neb., and Tex., and irregularly to Mich., Wis., and s. Io. June, July.